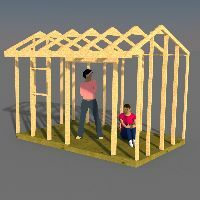 It's always a good idea to check your local shed building codes before you start construction of your shed. In my county for example, a shed 100 sq. ft. and under does not require me to obtain a building permit. I would typically only have 2 inspections if I had to obtain a permit, the first being the footer inspection, and the last being the final inspection. I know you are wondering what a footer inspection is. (when you hear the term footer it usually refers in some way to concrete!) Well, the footer inspection is simply how you build your shed foundation. Obviously the type of shed foundation you need will depend on the shed building code in your county. 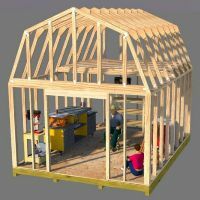 Once the footer inspection was approved, then I could continue building my shed, and after I completed construction, I would call for a final inspection. Nothing to complicated about it, you just have to follow your counties guidelines for building your new shed and you will be fine! 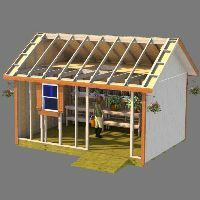 What Do I have To Do To Get My Shed Building Permit? Most usually in order to get a building permit you would have to submit a plot diagram showing the location of the proposed shed on your property with distances shown from the shed to property boundary lines. Also a set of plans will need to be submitted like a floor plan and elevation views. Its been my experience that a plan showing elevation views of your shed is sufficient for most county building inspectors. As I mentioned earlier, I got 2 inspections - a footer inspection if there was one, and then the final inspection. When your county does an assessment of your home, which is usually about every 10 years, they will check to see if you have done any exterior improvements to your home of any additions of buildings. If you have, and you didn't get a permit for them, they will usually just make an adjustment to your property taxes. I have not been issued any penalty payment for failure to file permits, I've just seen my taxes increase! Your county however may different. I can only speak for my own. 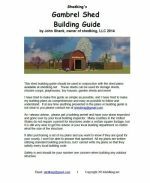 Another issue is that if you go about selling your home, and the buyer is going FHA, and they see structures built without permits, they usually require a permit be obtained. Also, if you are in a home with an FHA loan, and you go to refinance and didn't pull permits, you will probably be required to do so before refinancing can proceed. Its like this, getting a permit is not that expensive and well worth the minimal cost. Why take any chances? Return to the learning center.